One-day children's festival in Wantirna South filled with excitement, fun and adventures! Get ready for a day filled with fun, excitement and adventure this September with the launch of Just 4 Fun Children's Festival. Entertain your kids from 10am till 5pm on Sunday 30 September 2018 at the Just 4 Fun Children's Festival. Enjoy live performances (Paw Patrol, The Kazoos, Tim Credible the Magician, Le Petit Circus) carnival rides, face painting, footy player and basketball player appearances, interactive activity stations, a chance to meet and greet your favourite performers and so much more. 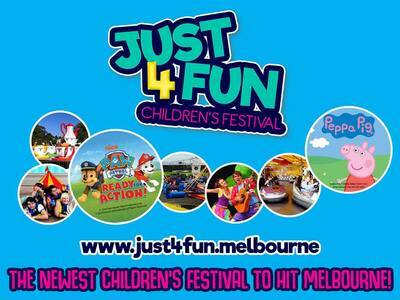 We're delighted to offer 2 x KidTown Melbourne readers the chance to win a Family Pass to the Just 4 Fun Children's Festival on Sunday 30 September. Tickets are valued at $90 and we have two passes to giveaway. To enter, like this post on Facebook, and tell us why you would like to win in the comments. Feel free to tag your friends for more entries! Comp ends Sunday 23 September at 9pm AEST. The winner will be selected at random and contacted via Facebook.